You are here: Home › Further Reading › JFK Assassination FAQs › What Does Noam Chomsky Say About the JFK Assassination? Although Chomsky appears to accept that the assassination was not the work of a lone nut, he notes that it did not lead to significant changes in public policy, and that the event is thus of little importance. Noam Chomsky is perhaps the best–known public critic of US government policy and actions. He is famously unconcerned about the JFK assassination, and is often accused of failing to recognise the importance of the event. It was clear that what Chomsky “won’t be able to decide” until he returned from England was not the question of whether or not there was a conspiracy — that he had given every indication of having already decided in the affirmative — but whether or not he wished to participate actively, even to assume a leading role, in the movement to reopen the case. The core issue in the current Kennedy revival is the claim that JFK intended to withdraw from Vietnam, a fact suppressed by the media; and was assassinated for that reason, it is prominently charged. Some allege further that Kennedy was intent on destroying the CIA, dismantling the military–industrial complex, ending the Cold War, and opening an era of development and freedom for Latin America, among other forms of class treachery that led to his downfall. … there is a shared belief across this spectrum that history changed course dramatically when Kennedy was assassinated in November 1963, an event that casts a grim shadow over all that followed. The article goes on to provide evidence to support Chomsky’s interpretation, a topic he covered fully in his book, Rethinking Camelot: JFK, The Vietnam War, and US Political Culture , South End Press, 1993. This is the area in which Chomsky differs from his detractors among the JFK assassination community. He finds no evidence of the significant political changes which surely would have happened had the assassination been the result of a high–level conspiracy. Because the assassination was not the result of a high–level conspiracy, it is not of any real importance. For more on this topic, see The Political Context of the JFK Assassination. I know very little about the assassination. The only thing I’ve written about it is that the claim that it was a high–level conspiracy with policy significance is implausible to a quite extraordinary degree. History isn’t physics, and even in physics nothing is really ‘proven,’ but the evidence against this claim is overwhelming, from every testable point of view, remarkably so for a historical event. 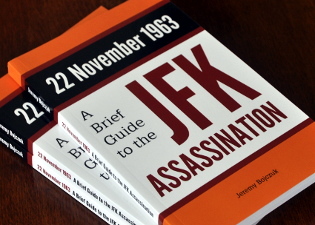 Given that conclusion, which I think is very well founded (that I have written about, a lot), I have no further interest in the assassination, and while I’ve read a few of the books, out of curiosity, I haven’t given the matter any attention and have no opinion about how or why JFK was killed. People shouldn’t be killed, whether they are presidents or kids in the urban slums. I know of no reason to suppose that one should have more interest in the JFK assassination than lots of killings not far from the White House. … One cannot adopt a left–wing perspective (or any other perspective) on an issue that one has no interest in and nothing to say about. … There is no “left–wing” or “right–wing” perspective. The evidence is so overwhelming that questions of interpretation hardly arise. If someone can show that they do, I’ll gladly look. But what I have looked at on this question (for example, various elaborate theories about JFK’s alleged intentions on Vietnam, or policy changes resulting from his death, or similar things about Cuba, the Cold War, etc.) simply does not begin to withstand rational inquiry. That’s true even of work by personal friends who are serious scholars on other issues, but who become so irrational on this issue that they cannot even read the words that are before their eyes, sometimes in the most remarkable ways. As for whether “power elites perceived JFK to be a threat to the status quo,” the statement is close to meaningless. If someone can produce some coherent version of the statement, and then some evidence for that version, I’ll be glad to look at it. I don’t know Parenti’s work well, but most of what I’ve read is quite good and useful, except on this topic. That’s not unique to him. The JFK assassination has engendered a kind of cult–like reaction, and ordinarily rational people act in what seem to me very strange ways. The remark about “personal friends who are serious scholars on other issues” may refer to, among other people, Peter Dale Scott, with whom Chomsky edited the Pentagon Papers. Scott believes that Kennedy had planned to withdraw US troops from Vietnam; see his Deep Politics and the Death of JFK , University of California Press, 1993, pp.24–37, in which he argues against several of the points made by Chomsky in his ‘Vain Hopes, False Dreams’ article. And as far as the popular movements are concerned, I think that they’re dissipating a lot of energy on inside issues, many of them. There’s a lot of self–destruction in my opinion. Take for example all this frenzy about the JFK assassination. I mean I don’t know who assassinated him and I don’t care, but what difference does it make? It’s not an issue of any general political interest. And there’s a huge amount of energy and effort going into that. If somebody could show that there was some general significance to the assassination, that it changed policy, or that there was some high–level involvement or whatever, then it would be an important historical event. Other than that it’s just like the killing of anyone else. Naturally you’re upset when somebody gets killed, but why is it an issue for the popular movements any more than the latest killing on the streets of Hoboken? The Left (I use the term loosely), the whole array of popular movements and dissident groups and so on have spent huge energy and effort in this. The Trilateral Commission, the Council on Foreign Relations, all these other things that people are racing around searching for conspiracy theories about — they’re “nothing” organizations. Of course they’re there, of course rich people get together and talk to each other, and play golf with one another, and plan together — that’s not a big surprise. But these conspiracy theories that people are putting their energies into have virtually nothing to do with how the institutions actually function. The Kennedy–assassination cult is probably the most striking case. I mean, you have all these people doing super–scholarly research, and trying to find out just who talked to whom, and what the exact contours were of this supposed high–level conspiracy — it’s all complete nonsense. As soon as you look into the various theories, they always collapse, there’s just nothing there. But in many cases, the left has just fallen apart on the basis of these sheer cults. … A lot of things have gone wrong in the last thirty years, for all sorts of independent reasons. I mean, the Civil Rights Movement made great achievements, but it never lived up to the hopes that many people invested in it. … Real wages have been declining for twenty years. People are working harder, they have to work longer hours, they have less security — things are just looking bad for a lot of people, especially young people. … And in this kind of situation, it’s very easy to fall into the belief that we had a hero, and we had a wonderful country, and we had this guy who was going to lead us, we had the messiah — then they shot him down and ever since then everything’s been illegitimate. So really there have to be serious efforts to get past this, I think. Really the book is not about the Kennedy assassination. What it’s about is the build–up to the war in Vietnam, which we now know a lot about because of recent documentation, and it shows very clearly what was going on. Kennedy just launched an attack against South Vietnam and hadn’t the slightest intent of ending it short of victory. Also interesting, at least I thought it was interesting, in the last chapter I went through the accounts that have been given of that period, and it’s very striking to see. There were a lot of memoirs written at the time by people like Arthur Schlesinger and others and all of these memoirists completely revised their account after the Tet Offensive. The Tet Offensive in January of 1968, that made the war unpopular. American corporate elites decided at that point that it just wasn’t worth it, it was too costly, let’s pull out. So at that time everybody became an opponent of the war because the orders from on high were that you were supposed to be opposed to it. And after that every single memoirist radically changed their story about what had happened. They all concocted this story that their hero, John F. Kennedy, was really planning to pull out of this unpopular war before he was killed and then Johnson changed it. If you look at the earlier memoirs, not a hint, I mean literally. Like Schlesinger in his 940–page book has less about the withdrawal than the New York Times did. And it’s not that any new information came along, it didn’t. The new information that came along just showed more that he had no intention of withdrawing. But the war became unpopular, therefore people had to rewrite the story. And they did it in the most amazing way. I mean this is the kind of thing you might have found in Stalinist Russia and it happened right here in a free country. The real question is, are there groupings well outside the structures of the major institutions of the society which go around them, hijack them, undermine them, pursue other courses without an institutional base, and so on and so forth? And that’s a question of fact: do significant things happen because groups or subgroups are acting in secret outside the main structures of institutional power? Well, as I look over history, I don’t find much of that. I mean there are some cases — for instance, at one point a group of Nazis thought of assassinating Hitler. Okay, so that’s a conspiracy. But things like that are real blips on the screen, as far as I can see. … [The Martin Luther King assassination is] the one case where you can imagine pretty plausible reasons why people would have wanted to kill him, and I would not be in the least surprised if there in fact was a real conspiracy behind that one, probably a high–level conspiracy. I mean, the mechanisms were there, maybe they would have hired somebody from the Mafia or something to do it — but that conspiracy theory is perfectly plausible, I think. And interestingly, I’m not aware that there’s been very much inquiry into it — or if there has been, I haven’t heard about it. But in the case of the one everybody’s excited about — Kennedy — I mean, nobody’s even come up with a plausible reason. In fact, that’s a pretty dramatic contrast, isn’t it: the case of the King assassination is on its face very plausible, and the case of the Kennedy assassination is on its face extremely implausible — yet look at the difference in treatment. By “a plausible reason”, he presumably means a reason for a conspiracy involving individuals within high–level government institutions rather than one involving some combination of rogue CIA agents and war–fixated generals, perhaps topped up with an assortment of anti–Castro Cubans and mobsters. Michael Parenti, in ‘The JFK Assassination: Defending the Gangster State’, points out that even if Kennedy had posed no actual threat to elite power, he may well have appeared that way to a group of conspirators who were on the fringes of elite institutions. In an online discussion about the terrorist attacks of 11 September 2001, Chomsky makes the observation that, as in the JFK case, 9/11 conspiracy theories “draw enormous amounts of time and energy away from serious activism on urgent matters (and may well be welcome to those in power for that reason, as the JFK assassination investigations have been, so internal government documents indicate)” (https://zcomm.org/zblogs/conspiracy-theories-by-noam-chomsky/). Chomsky goes into more detail about the benefits to power of paranoid 9/11 conspiracy theorists here: http://www.debunking911.com/massivect.htm. Oliver Kamm, Chomsky and Conspiracy Theory, quotes a passage in which Chomsky in turn quotes a suggestion that a Palestinian terrorist may have been an Israeli agent. This suggestion is assumed to meet the definition of a conspiracy theory. Kamm assumes further that because Chomsky reports the suggestion, he believes it. Hey presto: Chomsky is transformed into a conspiracy theorist. Nick Cohen, ‘Chomsky and Conspiracy Theories’, Standpoint , 21 November 2009, deals with the media’s depiction of the Trnopolje camp in Bosnia: “the sinister figure of Noam Chomsky hung around the fringes of the conspiracy cheering on the manufacturers of fake history.” For the other side of the story, see http://www.chomsky.info/interviews/20060425.htm and ‘A Malign Intellectual Subculture’ at medialens.org. He is aware that the assassination was almost certainly the result of a conspiracy of some sort, and not the work of a lone nut. The assassination had no clear political consequences. In particular, there was no significant change in official US policy in important areas, such as Vietnam and Cuba. The absence of a significant change in policy between the Kennedy and Johnson administrations demonstrates that any JFK assassination conspiracy did not originate at a high level of the US government. While the killing of President Kennedy was regrettable, it was no more or less tragic than any other murder. People who identify themselves as left–wing, and who are disposed to question the current distribution of power, could occupy their time more productively than by trying to work out who really killed President Kennedy. Excessive interest in a relatively trivial event is irrational. It is not always safe to assume that Chomsky has been reported accurately, of course. His views have often been misrepresented, most egregiously in the matter of Robert Faurisson, when Chomsky’s support for the freedom of expression of a Holocaust denier was taken to imply his support for Holocaust denial itself (see Noam Chomsky, ‘His Right to Say It,’ The Nation , 28 February 1981; see also Pierre Vidal–Naquet, ‘De Faurisson et de Chomsky,’ which objects on other grounds to Chomsky’s behaviour). If you believe in freedom of speech, you believe in freedom of speech for views you don’t like. Goebbels was in favor of freedom of speech for views he liked. So was Stalin. If you’re in favor of freedom of speech, that means you’re in favor of freedom of speech precisely for views you despise. It ought to be clear to anyone who has read this article that what Chomsky is against is the idea that the JFK assassination was the result of a conspiracy that originated at a high level within the US government. This is absolutely not the same thing as a belief in the Warren Commission’s poorly supported lone–nut hypothesis. For more about this crucial and widely misunderstood distinction, see The Political Context of the JFK Assassination.